The first year of your child’s life is often a blur. Then, one day you wake up, have a one year old and it feels like they are constantly teething. Man, I feel you on that one. 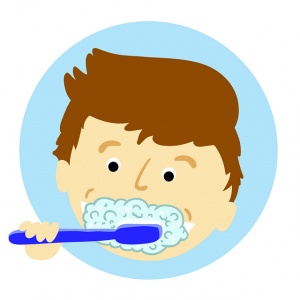 When should you take that toothy grin to see a dentist and what can you expect? It is a well-established recommendation that a child sees a dentist within six months of getting their first tooth or no later than age one. That first visit at age one is about more than just counting teeth. At your son or daughter’s first visit you can expect a discussion about your concerns, oral hygiene, and diet (hello, who knew crackers were notorious for causing cavities?). After addressing all the important topics of a toddler’s oral health, Dr. Megan will perform a knee-to-knee exam on your little one. What is a knee-to-knee exam? Just as it sounds! Dr. Megan will sit with her knees at yours, and your child will have their head in her lap for easy visualization. During this exam, Dr. Megan will assess their teeth for development, cavities, oral hygiene, and overall oral health. She will also perform a cleaning and apply fluoride varnish – to help make the teeth super strong and resistant to decay! 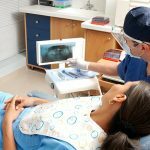 Have an older kiddo that hasn’t been to the dentist yet? No judgement here! Depending on your child’s age and level of apprehension, this appointment may be done in the knee-to-knee position or in the big kid’s chair. The steps are all the same – time will be spent talking about a variety of dental topics and then an exam and cleaning will be done. 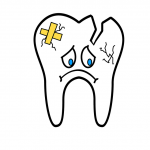 If your kiddo seems super cooperative and they have teeth that touch, we may try and get x-rays of those teeth to visualize cavities in-between the teeth. Whether your kiddo is coming for a cleaning or a filling, the first or 5th time, here are some tips to make each visit a breeze. Talk positively about the dentist! It may sound funny to scare your child with a dental horror story, but whether a joke or in good fun – your kiddo will have that story in the back of their mind. Never threaten a “shot” if they behave badly. In fact, we avoid the “S” word all together. Dr. Megan has a variety of behavior modification techniques she uses but telling a little one they will get a shot is not one of them! Try and plan visits around your child’s best hours. While not always possible, dental visits go so much smoother when your kiddo isn’t over tired or missing snack time. You know best if mornings or afternoons are better for your kids – you’d be amazed at how scheduling the right time can make or break an appointment. Navigating parenthood is hard! Please don’t hesitate to reach out to Dr. Megan or the team at Smiles Family Dentistry if you have any questions regarding your kiddos teeth!